Starting a new fitness routine can be a lot to take in. Learning the proper form and technique can seem intimidating, but that’s not all you need to be thinking about. Another important aspect is the order you perform the exercises. While the sequence of the workouts can be shifted based on needs and goals, there are general rules that everyone should follow for an effective routine. One hard and fast rule for a successful exercise program is to always begin with a cardiovascular warm-up. For example, spending five minutes on a bike, treadmill or rowing machine is a great way to start. The purpose of a cardiovascular warm-up is to elevate your heart rate, warm up your muscles and ease your body into more strenuous activity. 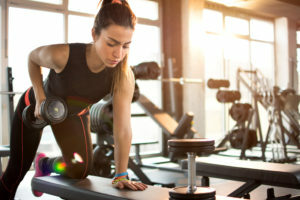 After completing your five-minute cardiovascular warm-up, you should then move on to resistance training (such as weights), or a full cardio workout. In order to have a successful exercise routine, you need both of these elements. It doesn’t matter which order you complete your cardio and resistance training—you just need both for the best results. When completing a resistance training program, it is typically best for the sequencing to first focus on large muscles and complex exercises and then progress down to smaller muscle groups and isolated exercises. For example, squats focus on working the large muscle groups of the legs, including the glutes, hamstrings and quadriceps. On the other hand, leg extensions only work the quadricep muscles. Since squats work more muscle groups and take more focus, they should be completed before doing leg extensions. There are times when it might make sense to deviate slightly from these guidelines based on various individual factors, but in general, they should apply in most workout routines.